The Launchings section of WB No. 264, September/October 2018, shows a 26′ Monomoy surf rescue boat recently launched in northern California. Ejler Hjorth-Westh of Elk, California, was commissioned by the Noyo Chapter of the Traditional Small Craft Association in Fort Bragg to build the Monomoy. He and a crew of six amateurs worked on the construction of the glued-lap plywood boat for six weeks from September 18 to October 28, 2017. Hjorth-Westh is on the faculty of The Krenov School at Mendocino College in Fort Bragg, but led this project at his own shop in Elk. The team built the boat from U.S. Coast Guard plan No. 90872 drawn in 1937. This design has quite a following in that part of California. 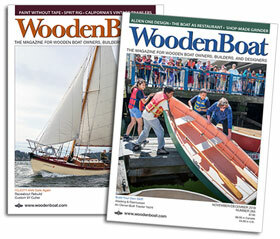 The Bay Area Whaleboat Rowing Association coordinates races and other Monomoy events for nearly a dozen rowing clubs in the San Francisco area. The Noyo TSCA will take part in those events in the coming months. Hjorth-Westh builds boats by eye—he calls it “building in air.” He starts with several key measurements, and then builds the boat right-side-up without molds. With the Monomoy he lofted the offsets of stations 3, 5, and 7, as well as the stem and stern. Next, they shaped the bow and stern stems from the lofting, attached them to the keel plank, then aligned everything precisely on the strongback. The 1937 Coast Guard plans for the Monomoy surf boat. Student Tom Erickson built this model from the USCG plans. Chart showing plank widths and bevel depths at five key stations on the surf boat. Stems and keelplank have been fastened together are being set up on the strongback. Two builders check that everything is squared up and plumb. 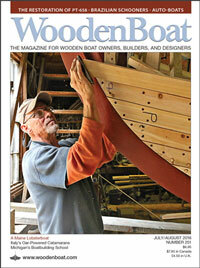 The keel, garboard, and other planking are all built from Hydrotec plywood set in epoxy. After clamping the starboard garboard to the keelplank, the team is now fitting the port garboard. Both garboards and broad strakes have been glued on, and the broads are clamped until the epoxy dries. Each plank is beveled to fit its neighbor. The builders shaped the planks according the dimensions shown on the above chart, then they are attached to the boat in pairs. Six strakes have been attached, with the last pair clamped and waiting until the epoxy has set. Hjorth-Westh holds up the planking pattern the team created at Station 5. This was made with the derived bevels shown on the chart above. The builders shape the bevels on the 11 planks at the five points on the chart and then join them with smooth bevels at all points in between. Eight of the 11 planks are now in place. After installing the sheerstrake, the crew started steaming the frames. Five people work together to get the first frame bent into place. Nearly all of the full-length frames have been clamped in place. When they are done, the crew will install half-frames at each end of the hull. The clamps, installed on every other frame rest on the keelson. The floorboards are installed in several sections. The Monomoy rescue boat has four rowing stations, each with adjustable foot braces. The floorboard sections supporting the foot braces are removable. One of the builders dry-fits the steam-bent starboard gunwale. Team members spread epoxy on both surfaces, then glued the gunwale in place. The forward and after thwarts under construction. Everything in place but the forward and after thwarts. After six weeks of work the team launched the boat in October 2017. The building crew gathers in the boat to mark its completion. The crew poses in front of the Monomoy just before launching. The crew and a couple of friends on the maiden voyage.